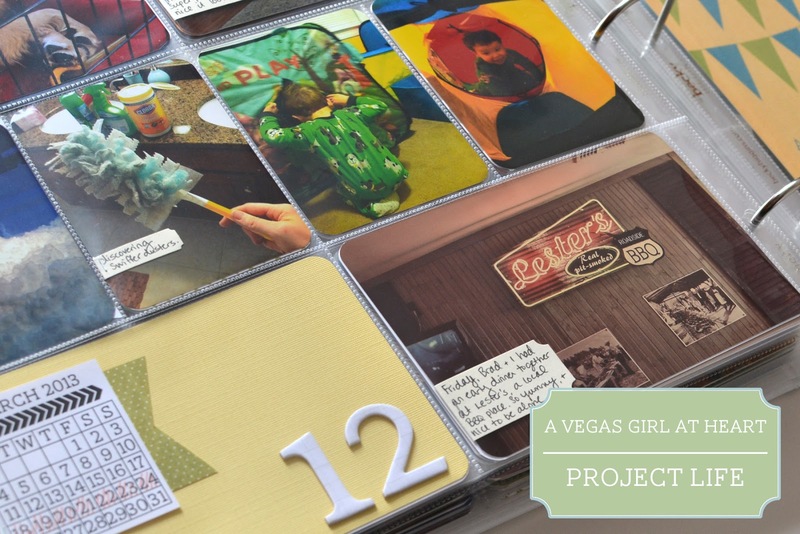 Welcome to Project Life 2013, week 12. If you're new to my blog, make sure you check out my post about my 2013 album. This week it was all about the photos. Literally. 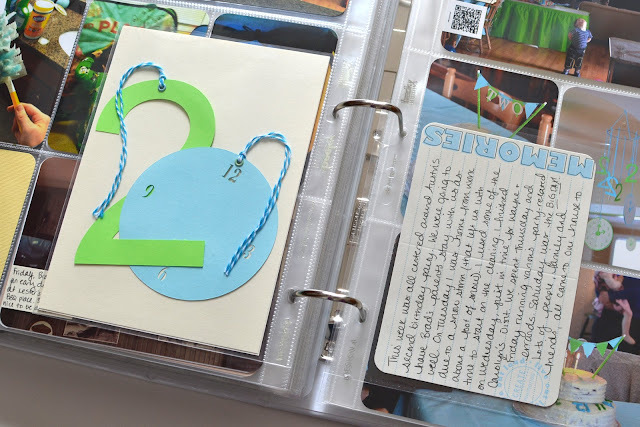 No journaling cards shown here. (I did, however, do a couple of inserts which I'll show shortly). 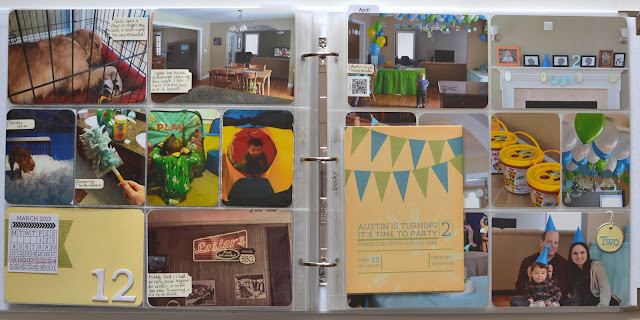 This week was mostly about getting ready for and celebrating Austin's 2nd Birthday party. If you would like to check out more photos from the party, please see this post. The left side of the spread is the first half of the week. We had a snowstorm on Tuesday, so I worked from home and started some of the major house cleaning I had to do prior to the party. Also, we were fortunate that Brad's parents could fly in for the party from California, so I wanted the house looking nice for them too :). I discovered Swiffer dusters, and loved them so much I wanted to document that moment. Sadie was at daycare for four straight days this week (she LOVES the Pet Smart Doggie Day Camp) so she was wiped out every night, snoozing in her crate. Brad and I went to a yummy local BBQ restaurant on Friday, and I took a photo that I edited with Pic-Tap-Go, so I put that in as well. The right side is all picture from Austin's party. I love how nice this looks, like a collage. 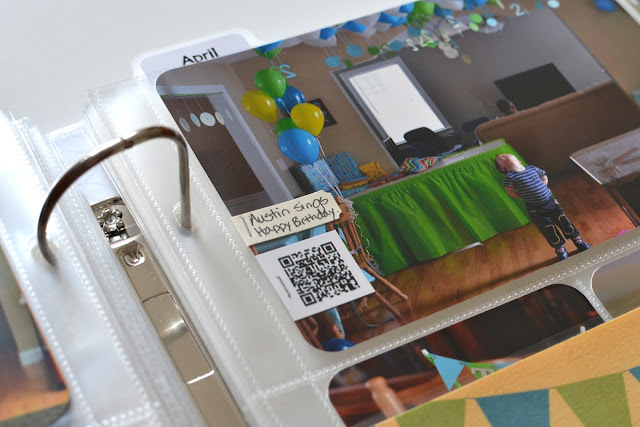 I did add a Martha Stewart tag with some Studio Calico Project Life Kit alpha stickers onto one of the photos. And a video of Austin quietly singing "Happy Birthday To You." One was Austin's birthday invitation, slipped inside a Becky Higgins 5x7 page protector. 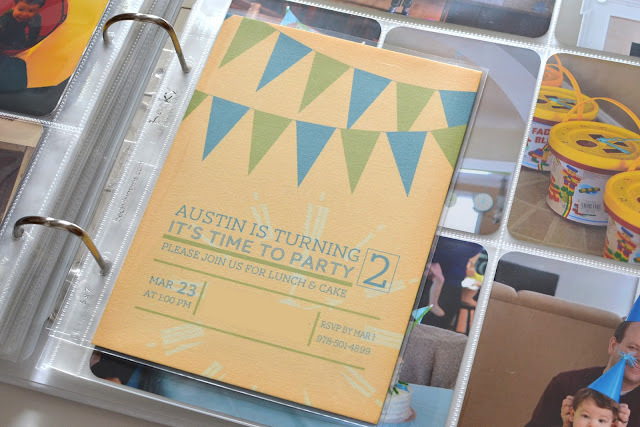 On the back side of the invitation (the address is blocked out, by the way, but that's what goes in the middle blank section), I added a couple of the decorations from the party. 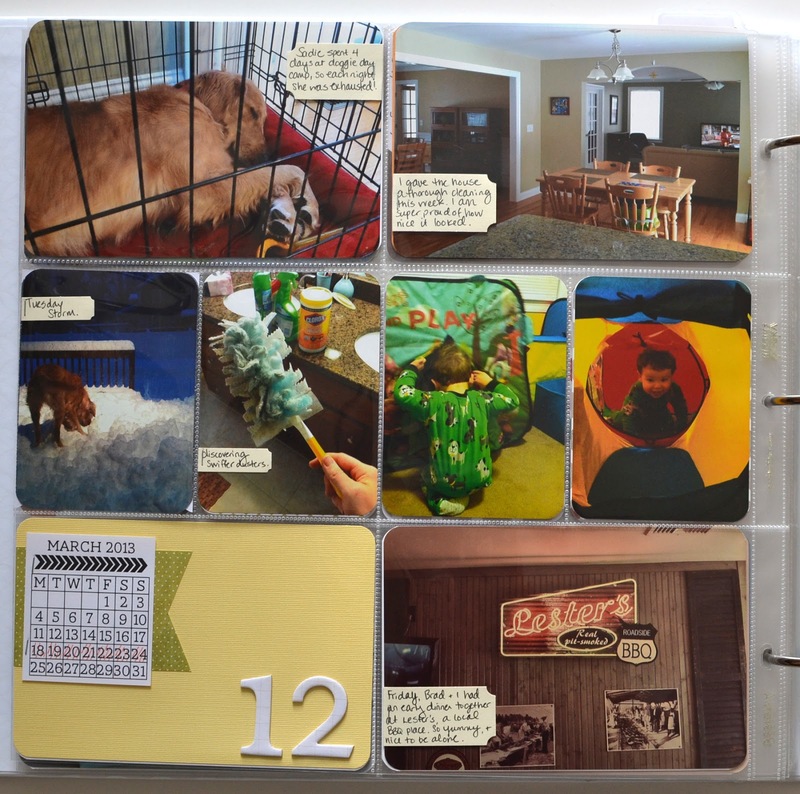 I also used a random 4 photo page protector, cut down to one 4x6 block, for a Clementine Edition bi-fold journaling card. 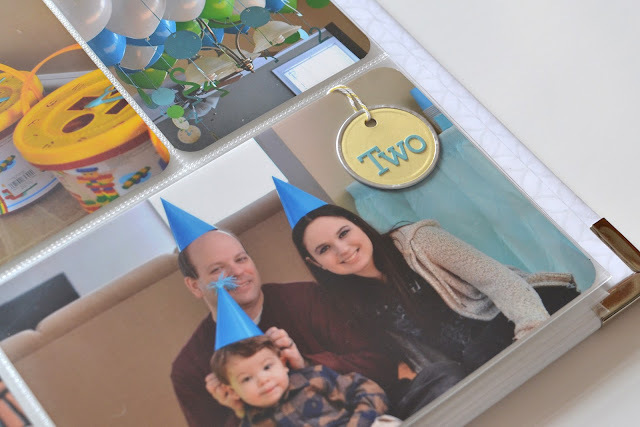 I used this card to journal about the week as a whole, rather than separate cards mixed in with my photos this week. Not something I do often but this week I had so many photos that I wanted to showcase, I thought this would be a good way to do it. And I really like the result. That's week 12 for you all! I can't believe we're almost a quarter way through the year. Crazy! In just a few months I'll have been doing Project Life for two years. Still loving this style of scrapbooking. Wonderful pages! :) I absolutely love how you're adding the videos. I've yet to do this, but would love to add that to my layouts or PL one day. Great job! Thanks Tanya! :) I wish I did it more often but I get lazy! Awesome pages!! You did a great job of capturing the every day stuff and the party. It will be so fun to look back and see that duster - who knows what might be invented by then. Definitely! I wish that I was into scrapbooking back when the earliest cell phones were coming out! How fun to see pics of those now! Great pages! Love all the photos. The addition of videos is something I keep thinking about doing, but still haven't gotten around to yet. Such an awesome thing to add. Yeah I need to do more of them! Thank you! Great PL pages. 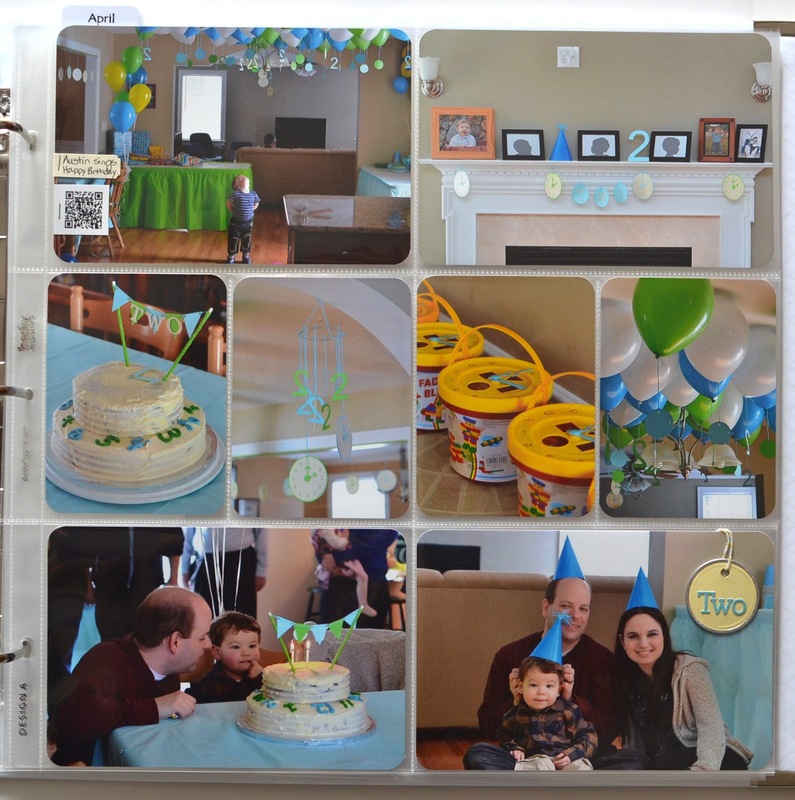 I just love how you have the birthday party in one page. And I love the green and blue balloons - looks awesome! And so cute little inserts. Thank you for the inspiration. 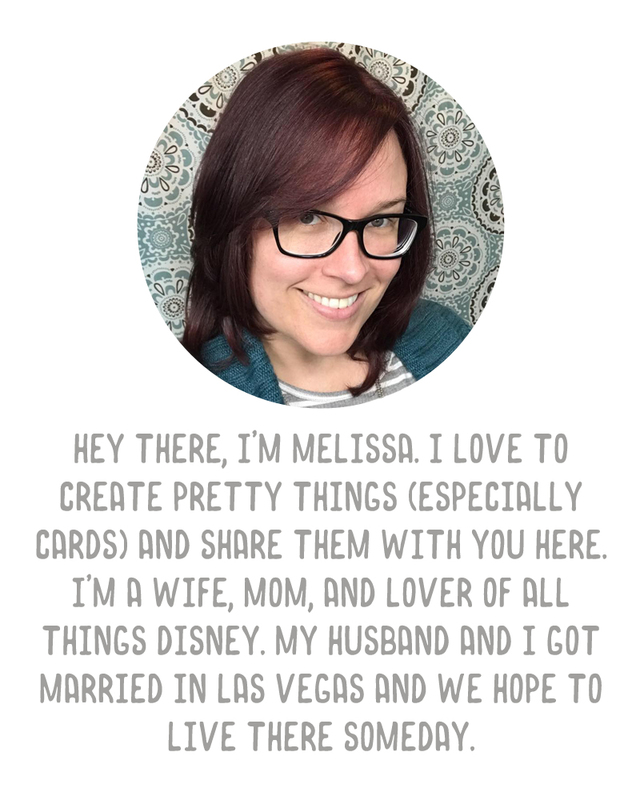 I found your link via The Mom Creative. I love the balance of simplicity and creativity. Wonderful pages. The birthday party decorations are fantastic!